4 Wheels - Road Tuning. 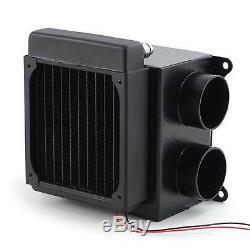 Universal 12v Lightweight Heater For Motorsport/Custom Build/Kit Car/Camper. This lightweight heater is perfect for kit cars, competition cars or any vehicle requiring a bit of warmth or for demisting windscreens. The unit is compact and lightweight yet still provides a high output. 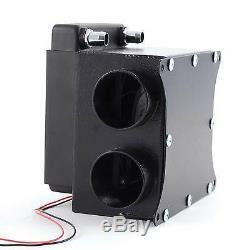 Ideal for replacing existing heaters when extra weight saving is required. Fitted with a powerful axial fan connected to a highly efficient copper matrix. Units with this power would usually be much larger and heavier, thanks to their innovative design you can retain high levels of performance in a smaller unit. Heat Output - 3.5kW. Amps - 3 (Startup), 2 (Continuous). Dimensions - 193.5mm x 169mm x 118mm. 2 / 51mm ducting stubs. Picture purely for illustration purposes only. Any subsequent orders can be delivered to an alternative address. ORDER NOTES - Due to the automated system we operate, we cannot guarantee to be able to view any notes or comments you add to your order. OVERSEAS ORDERS - Please be aware that we are unable to alter the value or description marked on orders destined overseas for the purposes of avoiding having to pay duty on your order. LISTING IMAGES - In most cases, the images used on our listings are generic and for illustration purposes only. Please ensure you read the listing title and description for an accurate summary of what is included in the listing. We are putting the'customer' back into'Customer Service'. Our shop is designed to be fast, clear and easy to use. However, we want you to be confident that if you have any questions or queries regarding any of our listings, our dedicated team of experts are at the other end of a telephone or keyboard waiting to help. Express and guaranteed services will need to be selected and paid for at time of ordering. At JJC, we strive to keep feedback 100% positive. We do this by offering quality products and 1st class customer service. Our customers satisfaction is the most important thing to us at JJC. The item "Universal 12v Lightweight Heater For Motorsport/Custom Build/Kit Car/Camper" is in sale since Saturday, October 18, 2014. This item is in the category "Vehicle Parts & Accessories\Car Tuning & Styling\Other Car Tuning & Styling". The seller is "jjcraceandrally" and is located in Wrexham.